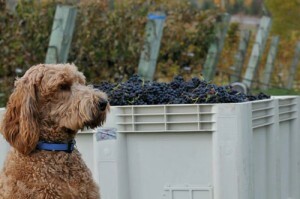 Koko, whose name comes from Gilbert and Sullivan’s Mikado, is part of the Markko breed and represents over 40 years of breeding with over 100 owners of this winery breed. Koko always stays around people yet has a herding instinct. In the last two years, Koko has fathered 32 pups in four litters. Bianca is an eight-year-old American Eskimo Spitz. She understands commands in both English and Italian. Bianca has her own label at Grimes Mill and her Bianca American White Table Wine won a Silver Medal at the Indy International Wine Competition. 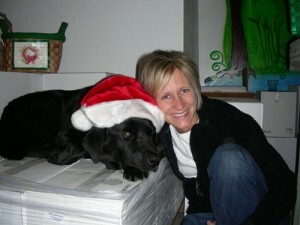 Rocky is a Black Lab. Jenny found him abandoned in a local cornfield. 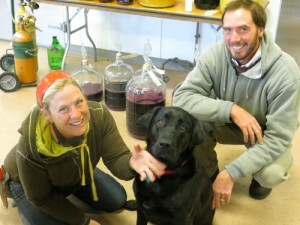 John and Jenny are the vineyard managers at University of Minnesota’s Horticultural Research Center where Rocky spends much of his time. When they were married in January 2012, Rocky held the wedding rings during the ceremony. Tug is an English Setter. He’s been with the winery since its first day over four years ago. Tug is on the label of Chateau Fontaine’s ‘Big Paw Red” wine. Sunny Patch is a four-year-old lab. Her name is a hybrid of several names. In her younger days, she would follow the tractor up and down every row. 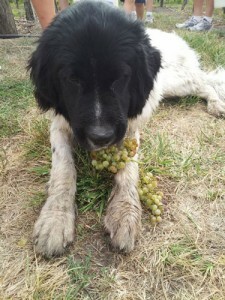 Now she has figured out that her owner is not going anywhere, so she lies at the end of the vineyard. Her favorite food is bird eggs. During shoot thinning and positioning, she already knows where the bird nests are and she waits patiently for the eggs to fall from their nests. Cooper is named after wine barrel makers. He’s an 11-month-old Landseer Newfoundland. 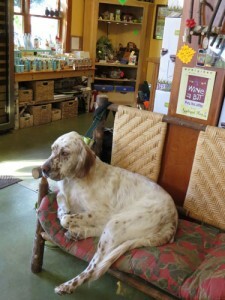 Coop is the youngest dog at the winery but he already has a large following. We don’t know how Georgia got up on the barrel, but she probably did not jump. She’s a key part of the Sollo family and has amazing powers of sensory analysis. Jackson is a 2-year-old Goldendoodle. 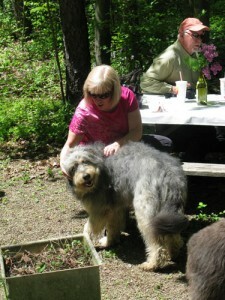 He is a gentle giant who is always excited by new visitors to the tasting room. Sage, Gill’s Pier’s first winery dog who passed away during 2011, was honored with his own label, ‘Just Unleashed,” an off-dry red wine. 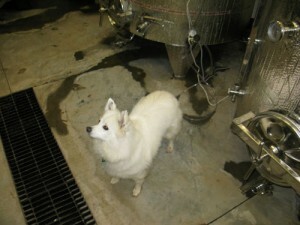 Cooper has been the winery dog at Mallow Run since the winery opened in 2005. He is reported to enjoy greater name recognition than the winery owners. 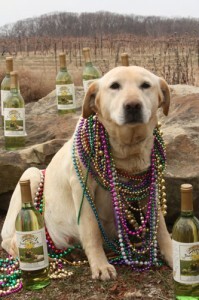 After being rescued from the local animal shelter, Cooper now hosts a two-day ‘Dog Days of Summer” fund raiser at the Winery every year. Proceeds from the event go to several local dog rescue organizations. 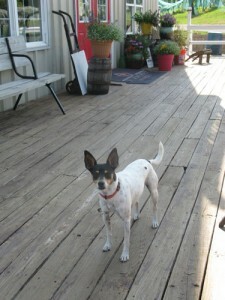 Corky, a Rat Terrier is a “pound puppy” who loves to play with wine corks. 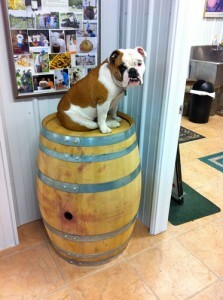 He likes to hang out with the other two winery dogs at Summerset, Lucy and Charlie (not pictured.) Corky and his partners make sure all visitors are personally greeted in the parking lot. I vote for Jackson, from Gills Pier Winery! 🙂 I love Goldendoodles! I vote for Berryville Vineyards Sunny Patch! She has her own wine and eats bird eggs before they hatch and eat grapes! I vote for Sunny Patch from Berryville. Sunny is the sweetest dog ever. I’ve met Georgia, and she is a wonderful hostess. She has my vote! Sunny Patch has my vote. Very sweet dog and always so friendly at the winery. I vote for Koko. The Markko dogs are really great dogs – friendly, social and fun.